This dish combines two of my absolute favorite things: seafood and pasta! I know seafood can seem intimidating to make and I used to feel the same but I’ve gotten a lot more comfortable the more I experiment. 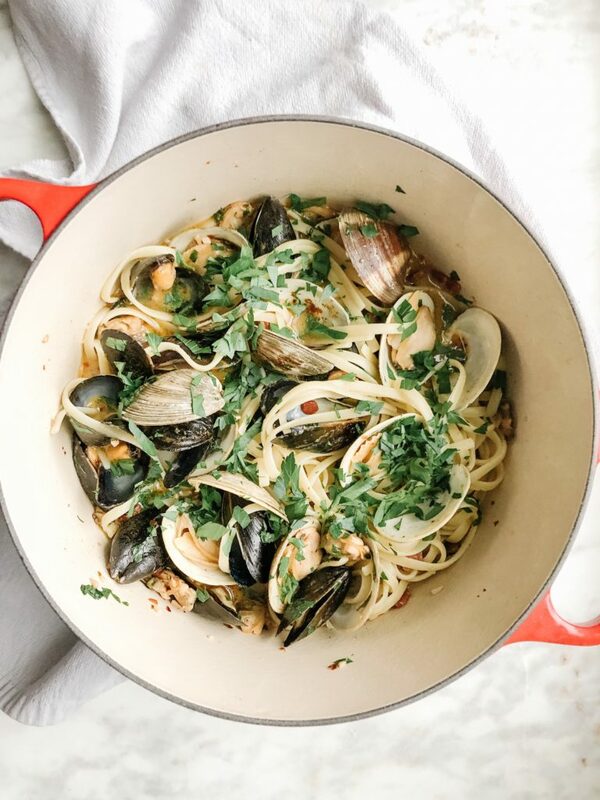 As soon as I made this pasta I realized how ridiculously easy clams are to make – the ‘hardest’ part is actually the cleaning involved in the prep process. When it comes to cooking these little morsels – they pretty much tell you when they are ready! 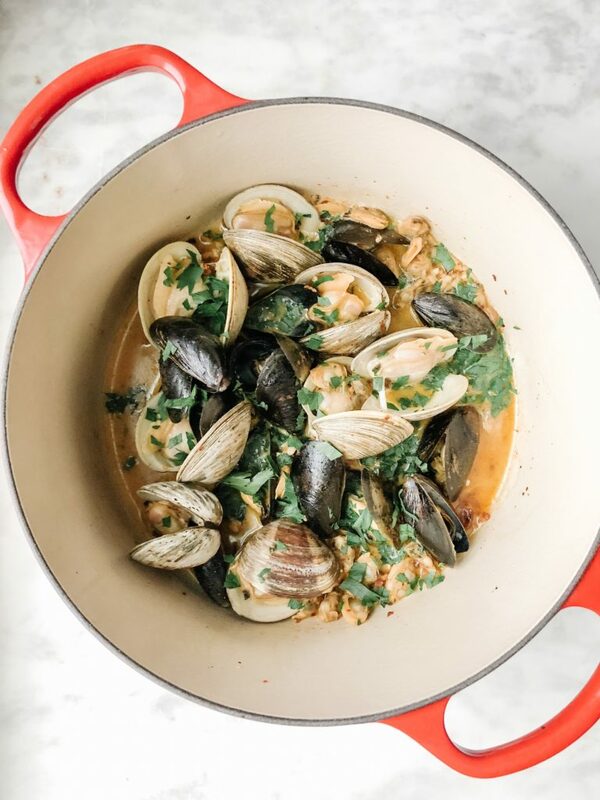 For my most recent rendition I included fresh mussels as well because my local seafood shop was running low on fresh clams – they were the perfect addition but you can definitely make it without for the same epic dish. If you do the latter, the sand will go right back into the crevices. This trick I actually learned by fluke because the shop I was buying clams at was low in stock – they showed me frozen clam meat as an alternative. So I ended up getting a package in addition to fresh clams and mussels, and it made for the perfect amount. I never like having seafood pasta at a restaurant where I feel like the pasta to seafood ratio is skewed towards pasta so why should that be the case at home! Plus the meat is what people really want, so the easy fix is get enough fresh clams for serving presentation and then extra clam meat. Once your ingredients are prepped (aka clams and mussels are washed – read above!) this recipe is relatively quick to assemble. I recommend starting by boiling water for your pasta. 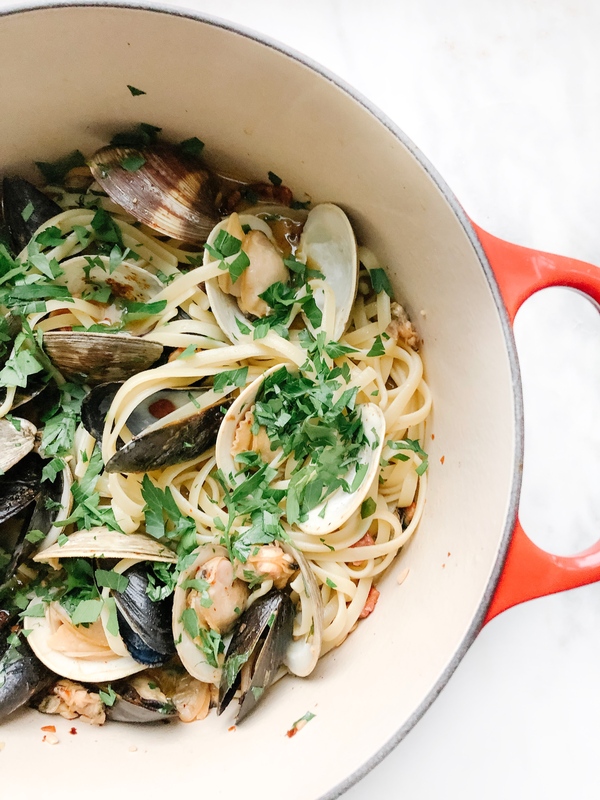 Once you put the pasta in the boiling water (follow package instructions for cooking) you can start heating up your saucepan for the sauce + clams and mussels. Next brown the pancetta or guanciale if you choose to include this in your dish (about 3-4 mins) on high heat. Turn the temperature down to medium heat, add the stick of butter and garlic and stir – don’t let your garlic burn. It should start to smell GOOD! Next add the red pepper chili flakes – add at your discretion, I personally like a bit more kick but if you don’t like spice a pinch will do. Then add your white wine and a generous amount of black pepper. Once your butter wine mixture is bubbling you are ready to add the clams and mussels. Add in the clams and mussels and cover the saucepan – let it sit for about 3 minutes and then check to see if all of the shells have opened up. If some are lagging give it another couple of minutes. If they still don’t open then toss them – no bueno! 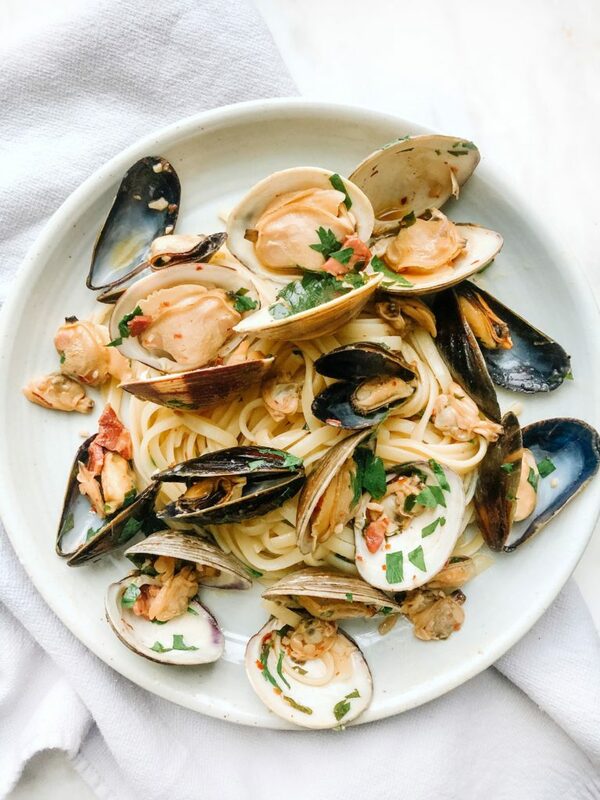 Your pasta should be cooked at this point so you can add it into the clam and mussel mixture along with 1/2 cup of pasta water to thicken the sauce. Add more salt and pepper to taste, top with parsley and serve. Oh and prepare to be amazed!